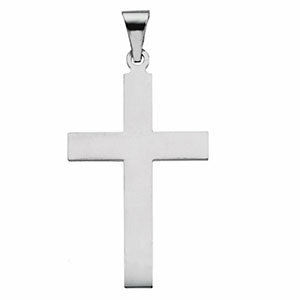 Classic style and the Christian faith go hand-in-hand with this white gold cross pendant from Apples of Gold. The 14K white gold cross pendant is premium quality without the premium price. This beautiful cross pendant will keep your style chic with this uncomplicated adornment. The white gold gives the cross pendant a hint of modern style but the lack of embellishment keeps this cross traditional in all the right ways. A white gold cross pendant is just the way to respect your faith and your fashion. We guarantee our Plain Polished Cross Pendant, 14K White Gold to be high quality, authentic jewelry, as described above.